Galician rabbi and historian; born in Cracow June 29, 1820; died there Nov. 20, 1892. His father, Jekuthiel Solomon, a scholarly merchant who claimed he was a descendant of R. Moses Isserles, died in 1833, aged forty-one. While diligently occupied with his Talmudical studies, he came across the "Ẓemaḥ Dawid," a chronological work by David Gans, which aroused his interest in Jewish biography and history. He received his ordination as rabbi from Solomon Kluger, Hirsch Chajes, and Berish Meisels, the lastnamed of whom was rabbi of Cracow until 1854. Dembitzer sided nevertheless with Meisel's rival, Saul Landau, in the quarrel about the rabbinate of Cracow. In 1856 Dembitzer became a dayyan in his native city, and was, like his older brother Jacob, advanced to the position of rosh bet din, which he held till his death. In 1874 he visited Germany and made the acquaintance of Zunz and other Jewish scholars, with whom he corresponded on historical subjects. Dembitzer's earlier works were all on halakic subjects, on which he was a recognized authority. His "Maginne Ereẓ Yisrael" (responsa, Lemberg, 1852); "Dibre Ḥen," which appeared as a supplement to Solomon Kluger's "'Abodat ha-Ḳodesh" (Zolkiev, 1863); and "Liwyat Ḥen" (Cracow, 1882) belong to that class. But the last-named, a critical commentary on the work "RABYH" of Eliezer b. Joel ha-Levi, which Dembitzer published from a manuscript, contains much valuable material for the history of the Tosafists, which is interspersed among the pilpulistic arguments of the main subject. His chief historical work, "Kelilat Yofi," of which the first part, containing biographies of the rabbis of Lemberg and of other Polish communities, appeared in 1888, and the second part, also biographical and historical, in 1893 (Cracow), is an important contribution to the science of Judaism. He is also the author of "Miktebe Biḳḳoret," a valuable correspondence with the historian Grätz about the Council of Four Lands ("Oẓar ha-Sifrut," iv. 193-243; also published separately, Cracow, 1892), and of a biography of the Tosafist Joseph Porat, which appeared posthumously in "Ha-Ḥoker," ii. 48-59. 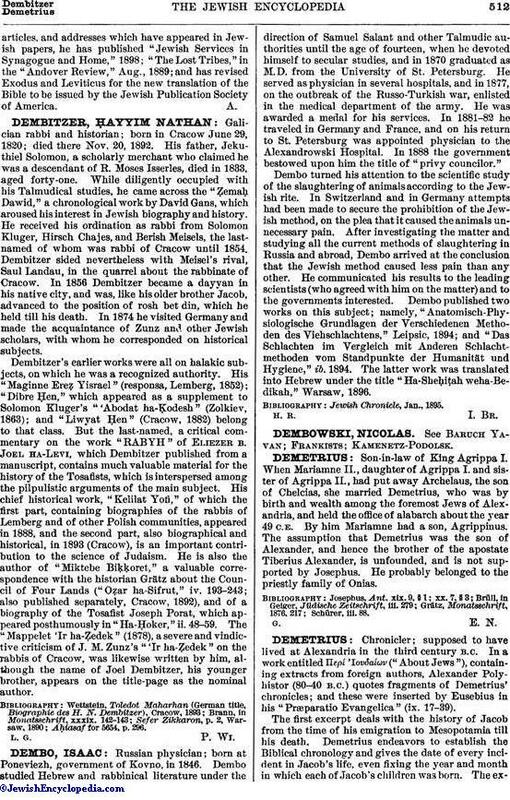 The "Mappelet 'Ir ha-Ẓedek" (1878), a severe and vindictive criticism of J. M. Zunz's "'Ir ha-Ẓedek" on the rabbis of Cracow, was likewise written by him, although the name of Joel Dembitzer, his younger brother, appears on the title-page as the nominal author. Aḥiasaf for 5654, p. 296.